New & Used Audi | Hyannis, MA | Serving Barnstable, Sandwich MA, Falmouth MA and Plymouth MA. Audi Cape Cod in Hyannis, MA treats the needs of each individual customer with paramount concern. We know that you have high expectations, and as a car dealer we enjoy the challenge of meeting and exceeding those standards each and every time. Allow us to demonstrate our commitment to excellence! Our experienced sales staff is eager to share its knowledge and enthusiasm with you. We encourage you to browse our online inventory, schedule a test drive and investigate financing options. You can also request more information about a vehicle using our online form or by calling 508-815-5600. Welcome to Audi Cape Cod in Hyannis, MA. We know why Cape Cod drivers love Audi vehicles, and we're here to find the perfect one for you at Audi Cape Cod. 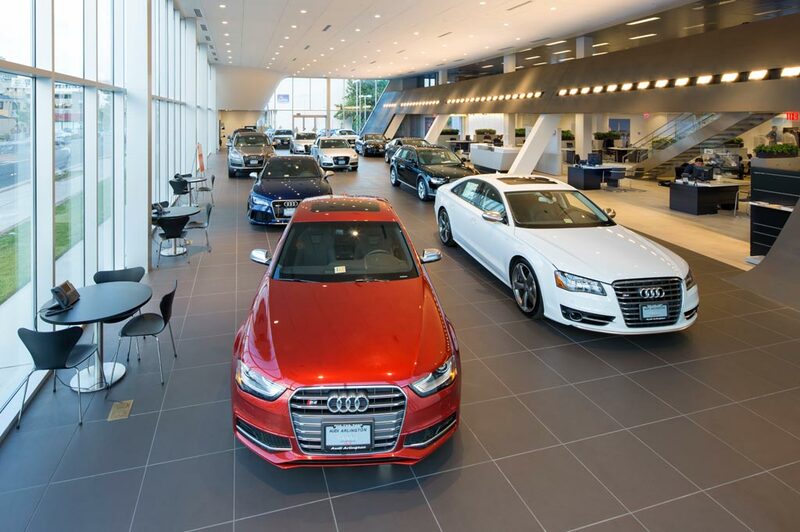 Our Hyannis Audi dealership stocks an impressive selection of Audi new 2018/2019 vehicles and Audi pre-owned vehicles to provide you with an unmatched selection, and our Pure Price policy guarantees that you'll find a terrific car that fits your lifestyle. If you're looking for an Audi dealership experience commensurate with the Audi brand, our dealership is just the place for you. We offer a wide variety of Audi's most popular models at our Audi dealership near Falmouth. From popular and powerful sedans like the new Audi A3, A4, A5 and A6 to SUV's like the Q3, Q5 and Q7, we offer models for every lifestyle. If you're looking for a quality new-to-you ride to fit within a tighter budget, our selection of used vehicles/pre-owned Audi vehicles and certified pre-owned vehicles presents the perfect compromise. We even stock used models from other premium makes to ensure our customers have the best selection possible. Audi Cape Cod's Pure Price policy means you can rest assured you're getting full transparency, and the talented Audi finance team at our Hyannis Audi dealership will help you find a financing solution that works for you. Audi Cape Cod isn't just about sales: we offer expert Audi service and repair procedures, too. From routine maintenance to post-accident restorations, we do it all at our Audi dealership near Yarmouth. We also offer Audi parts and accessories, and with our online service scheduler, you'll be able to find a convenient time to bring your Audi in for whatever it needs. Audi Cape Cod is conveniently located at 25 Falmouth Road in Hyannis, just a quick trip for drivers from all over Cape Cod and the South Shore. Visit us for a test-drive today, and see how we've earned our reputation as a trustworthy member of the Premier Companies family of dealerships. Audi Cape Cod is One of Your Premier Audi Dealers in Massachusetts. Getting a great deal at a great price is important and, when you come out to Audi Cape Cod, you'll always find something incredible and luxurious to love. Here at our Hyannis, MA dealership, we're ready to show you around our selection of vehicles and do business the right way with upfront pricing, honest employees, and the hands-on experience of a test drive that we know you deserve. Whether you're cruising around the highways on your way to your next errand, heading through town to go to work, or enjoying a relaxing drive through Cape Cod, our selection of elegant and high-performance new Audi models will serve you well. From Boston, to Plymouth, to Martha's Vineyard, to other cities and states all across the country, you'll be in the center spotlight behind the wheel of an Audi model. No matter where you're from in Massachusetts, make Audi Cape Cod your next stop for true automotive bliss. With our experts at your side offering you guidance through every step of the process - from finding the vehicle of your dreams, to getting financial assistance, to getting it serviced when necessary - you can count on us as one of your premier Audi dealerships in the area.